Charity Harley Ride, Las Vegas -Sponsored by the Security Industry Association (Ray was Chair, CCTV Group) after the ISC West Show. Ride went from Vegas, to Speedway, Valley of Fire (catered lunch), to lake north of Hoover Dam, to Hoover Dam, then back to Vegas and dinner. White Pass Train tour in Skagway, Alaska. Take the train to the top, flip the seats, and come back, I hung out on the porch taking photos in the cold and rain. All tour buses are not fancy, this looks like an old school bus, but it is what took us to Alaska Chilkat Bald Eagle Preserve. We took a ferry from Skagway to Haines, then this bus to the Park and the Jetboat below in the park. Jetboat Tour - Near Haines, Alaska. Takes you into the Alaska Chilkat Bald Eagle Preserve, a tour we took to photograph Eagles, something we want to do (still). We saw two Eagles, one in the wild, and one in the trees above the tour post, I think waiting for scraps. They kind of forgot to mention that the Eagles are only there in the winter, a really big ripoff as far as Eagles, although the scenery was great. Eagles is what we were after. Tawny and I camp to relax, to socialize with family and friends, and to provide us with photographic opportunities. We usually camp in Florida State Parks, and National Parks. Very rarely do we camp commercial, as they are expensive and do not provide a lot of nature opportunities. 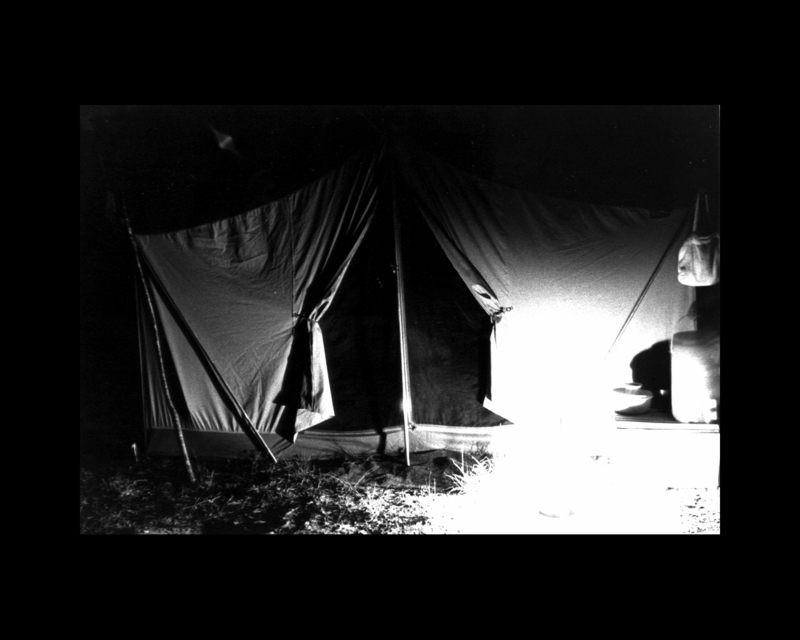 Below is some of our camping history. The winter of 2009-2010 was brutally cold, we know, Tawny and I were camping in it, yes, we were in a RV trailer, but there were no hookups, so we were cold! We ran a small generator in the day, charged the batteries, and had heat as long as the batteries lasted, but one night, the batteries shorted out! It was so cold, our cat Squeak even climbed inside our sleeping bags we were forced to dig out. We have not always had an RV to camp in, in fact, I was in the Boy Scouts, and when Tawny and I first met, and for many years after we were in a tent. This was when the world was still black and white. Our first trip together was in the early 90s after we met, in the tent above, and we went to Smokey Mountain National Park, via Ocala National Forest. We camped first in my old Jeep, which broke down all the time, then in my Ford Aerostar, which was great, Joe, Debi, Allana, (my brother, sister in law and niece) made another trip to the Smokies in the Aerostar in this tent. Then Tawny and I bought a small Ford Splash P/U truck, and then our first RV, a used Jayco pop up camper, which we camped all over the state, and yes, went to Smokey Mountain National Park again! We usually camp in Florida State Parks. Next in our quest for adventures, towing the pop-up with the truck, was tough, and did not have enough room inside to store anything, so we bought a Ford Explorer next. Jump forward a few years, and we upgraded from the pop up to a larger RV, I bought the RV from a friend who lived in Indiana, and we went to pick it up at the east end of Smokey Mtn National Park near Asheville NC.,coincidence. We purchased a Rockwood Roo Hybrid camper used. A hybrid is a camper that is full size, you can walk in it, but the front and back FOLD OUT to make queen size beds. This way the floor space is not used up by beds. We loved the hybrids! The gotcha was, the Explorer just did not handle towing the longer and heavier hybrid, so we had to upgrade the tow vehicle. This was a pattern, bigger camper, bigger tow vehicle, bigger vehicle and even bigger camper, and even bigger tow vehicle! We just need to hit the lottery! Our love of nature and camping, not to mention photography is an expensive hobby! So, we bought a Ford F150 pickup truck, put a topper on it, and off we went. Then we bought another type of hybrid, a Dutchman, this one was the same length, but a very different floor plan, and a leaf spring chassis. Then, we were set as far as camping was concerned, and took many trips. To the keys, to the Smokies again, Tenn., Georgia, North Carolina, South Carolina, and Florida. We were camping in the Keys in the fall and mentioned in our planning, that we would not change a thing about our camper, we loved it. Then we were camping at one of my favorite parks, Lake Kissimmee State Park near Lake Wales, Florida and drove to Tampa to see family for Thanksgiving from the park. We saw a really unusual camper on display at a RV dealer there, being Thanksgiving, they were closed. We finished our camping trip, and on Sunday when we finished packing up to head home from camp, we made the mistake of going to the dealer. We looked at the camper, went home, investigated for a week, got our own financing, found a dealer near us, and bought it. It is the first time we bought a NEW camper, and my nickname for the camper, is "WHAT WAS I THINKING". It is a great camper, and although within the tow limits of the Ford F-150, it was going to run it into the ground, as the camper is 30 feet long and weighs 9,000 lbs. So 5 months after buying the camper, we bought a used F-350 diesel dually truck. See what I mean about bigger camper vs tow vehicle? The amazing thing we are back where we started in RVs, a pop up! This time the pop up is a second floor on the camper! Yes, stairs take you up to a family room area, L shaped couch area, with a pop down TV, with 360 windows all the way around. There is a toy hauler section in the back, but if you don't have any toys in the garage, it has a Murphy Bed in the area that makes a queen size bed, so that is our master bed room. This camper is something else........!